The 'Shores of Tripoli' in the Marines' Hymn, Edward Preble and the U.S.S. Philadelphia are all hallmarks of the Tripolitan War of 1801. Following the exploits of John Paul Jones and the Continental Navy during the American Revolutionary War, the U.S. Navy would be called upon to protect U.S. foreign interests in the Mediterranean. In 1798, the Department of the Navy was created to safeguard American commerce against Barbary Coast piracy. The Tripolitan War—known as the First Barbary War today—would amalgamate American Naval power and diplomacy in American foreign policy as the young nation strived toward global prestige. Upon Thomas Jefferson’s assumption of the Presidency in 1801, he reversed American policy toward the Barbary Coast, which up until that point had paid regional sultans yearly tribute to ensure safe passage for American ships. In conjunction with cancelling the yearly tribute, Jefferson dispatched a “squadron of observation” to Gibraltar, who, upon arrival, was informed that Tripoli had declared war on the United States. Over the next two years, the U.S. Navy imposed a weak blockade of Tripoli and pursued brief skirmishes, both ineffective at achieving a swift resolution to the conflict. Commodore Edward Preble assumed command in June 1803, asserting a more aggressive naval approach. Preble’s first strategic offensive involved the frigate U.S.S. Philadelphia pursuing an offensive position in Tripoli harbor. The Philadelphia soon ran aground on the shallow reef at the entrance of the harbor while attempting to intercept two Tripolitan corsairs. American sailors were soon captured, and the Philadelphia, now under the command of Tripolitan forces, was anchored in the harbor, greatly increasing Tripoltian defense capabilities. Before Preble could continue his assault on Tripoli, the conundrum of the captured Philadelphia needed to be addressed. Lieutenant Stephen Decatur would lead a raiding party using the Intrepid, a captured ketch that would pose as an injured vessel, allowing the Americans to tie up alongside the Philadelphia. On February 4th, 1804, Decatur’s party was able to successfully execute their boarding operation and escape the decks of the Philadelphia as the frigate was engulfed in flames. As the Tripolitan Navy once again regressed to a fleet of corsairs, Preble rethought his strategy for entering the harbor and forcing Tripoli to the negotiating table. The next two months would consist of naval engagements in the harbor with American forces outfitted with smaller gunboats and bomb ketches. Though Preble was able to capture and sink multiple Tripolitan corsairs and silence many shore guns, Tripoli still refused to negotiate. Preble would return to America a hero, despite his inability to resolve America’s first foreign conflict. 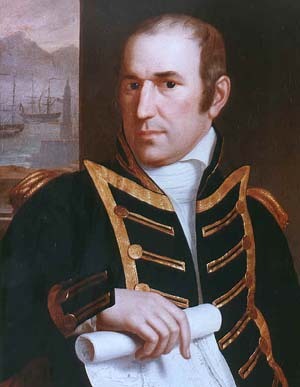 Commodore Samuel Barron would arrive in September of 1804 with reinforcements and take command of the American fleet. Barron’s command would shift American strategy from a blockade and offensive naval engagements to a land assault supported by naval power. Led by William Eaton, American consul to Tunis, and a detachment of Marines, a force of approximately 500 Greek and Arab mercenaries invaded the city of Derna in April 1805, opening Tripoli to land invasion. Tripoli soon capitulated and upon payment of $60,000 in exchange for American prisoners, the First Barbary War concluded as a statement of success for both American Naval power and American Diplomacy. Tags American Revolution, Edward Preble, First Barbary War, Marines, Marines Hymn, Samuel Barron, Stephen Decatur, the Shores of Tripoli, Tripolitan War, U.S.S. Philadelphia, William Eaton.